Roland Barthes and the Fantastic Four explore the world of wrestling! 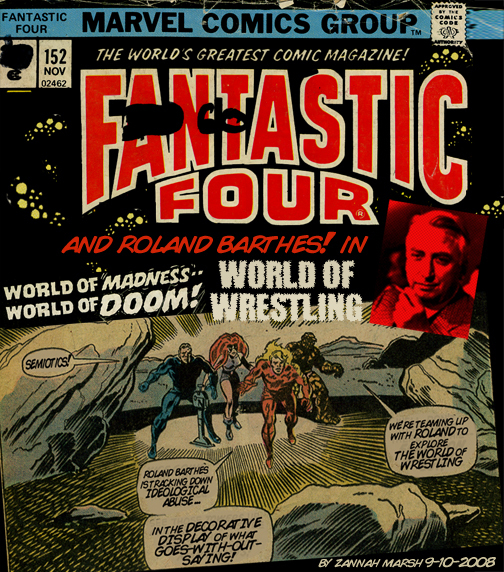 I fused excerpts of Roland Barthes’ essay “The World Of Wrestling” (published in his collection “Mythologies”) with a 1974 Fantastic Four comic book that I had in my collection. I manipulated the pages to add extra speech bubbles (since Barthes had more to say than the superheros) and remove distracting figures and objects from frames. Barthes’ essay on the hyper-amplified signs that characterize wrestling merged unexpectedly seamlessly with the overblown, simplified visual langauge of superhero comics. Read the full Barthes essay here.